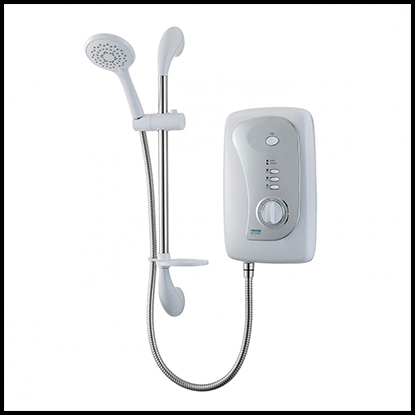 If you have been wondering what electric shower will best suit your showering needs, then this guide will help you find the best electric shower. Choosing the best electric shower for your bathroom is very important as this is something you and your family will use every day. Before making a decision, it is paramount to learn as much as you can about them. Here, we shall look at what they are, how they work, advantages of said showers, and our top six best electric showers on the current market. Let’s dive right into it. It is a self-contained water heating unit that heats and pumps out water as its being consumed. A user only needs to connect this device to a cold water supply and electricity, and you are good to go. These handy little devices work by warming cold water using its installed heating elements within it. It uses the same mechanism just as an electric kettle and heats water on demand. It comprises a heating element that heats cold water as it passes through the unit to the shower head. A user can control the water temperature by using a temperature dial located outside of your unit. It does not store any hot water nor does it have any pump. Why Consider An Electric Shower? This type is ideal for families and just about anybody that wants to have hot water available any time of the day. It is economically beneficial because you will only need to heat the amount of water that you need. When it comes to electric showers, the higher the kilowatts, the more powerful your water flow will be. When compared to other types of showers such as mixer or power showers, they tend to have a weaker water flow. Their kilowatts can range from 7.5 kW to 10.8 kW. A shower with this feature ensures that your water temperature remains steady throughout. It helps control the heating degree, preventing your shower from switching to cold water when another tap is opened somewhere else in your home. Phased shutdown allows your device to run cold water through its entire system for a few minutes after you shut off the shower. This helps minimise any lime scale buildup. An electric shower with different shower patterns allows a user to enjoy various water flow patterns. You are able to choose a pattern that suits you best, thus enjoying a more individual showering experience. A great thing about a shower that is adjustable is the fact that you can heighten or shorten your shower heads length to suit you. For example, a tall person can adjust the shower head to be higher, and a shorter person can do vice versa. Before making any purchase, you need to take into account your budget. How much are you willing to spend on it? Are you willing to go a bit overboard or do you have a set amount? Once you figure this out, then it is time to look for best electric showers that are within that price range. You will find some that have fantastic features and offer the best value for your money, while other brands will have limited features but are durable. It is up to you to choose what features matter to you the most; do you prefer flashy and cheap, or dull and affordable? What are your main concerns i.e. is it water pressure, heating temperatures, etc? After you have decided on what factors will influence your buying decision, then it is time to go shopping. Below are our top six best electric showers on the current market. These showers vary in wattage, prices, shapes, features, but they are all very durable and offer great showing experience. 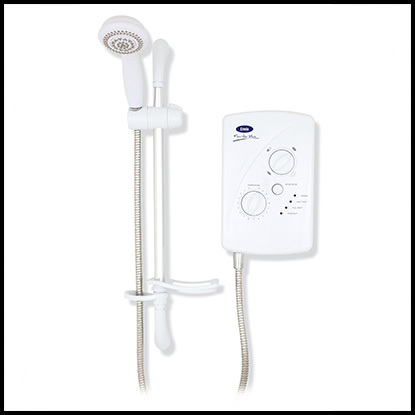 We have ensured that all customers, regardless their price range, will find something to suit their showering needs. Since you can control water temperature, you need not worry about the water getting hot or cold when someone turns on a hot tap or flushes a toilet somewhere in the house. You only heat the water you use – saves you tonnes of money on electricity. You can still shower with hot water even if your boiler is not working. Triton Martinique Electric Shower comes with a rotary temperature control that helps a user set and controls their water hotness or coolness. It comes with a five shower head spray pattern that will allow you to have great showering experience every time. It is available in two different models – 9.5 kW and 10.5 kW. Both provide you with exceptional water flow and pressure. This model has multiple cables and water entry points that are perfect for use when you are replacing an old shower with this Triton model. This product is pocket-friendly and comes with a 2-year full parts and labour guarantee. It comprises of a simple dial control that can be used for power selection – a user is able to choose from cold, economy, or high settings. This electric shower has a very easy to use dial temperature control that you can use to set your preferred temperatures. 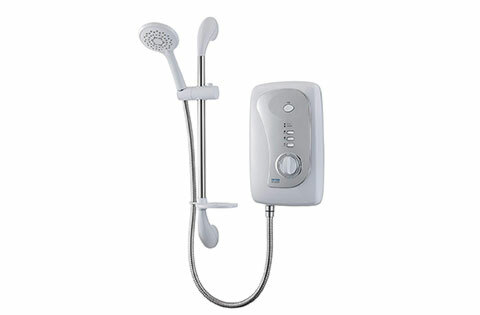 It also has a one button shower option, a low-pressure indicator, and a phased shutdown setting. Triton Martinique comes with a raiser rail kit that is used to store your soap and an adjustable shower head holder. It is very easy to install. Great option for individuals working on a budget. It has cold, warm, and hot settings – a user can then adjust within these settings from 1 to 10 dial. Gives users tonnes of options. Has a very strong wattage that will provide you with a fantastic shower flow and temperatures. Water pressure fluctuations happen rarely. 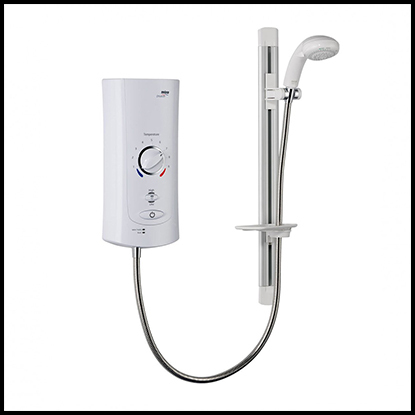 Triton Collection II electric shower is available in powerful wattage of 8.5 kW & 9.5 kW. It is able to heat more water in a shorter span of time. It comes with a phased shutdown mechanism that ensures no lime scale gathers inside your shower. 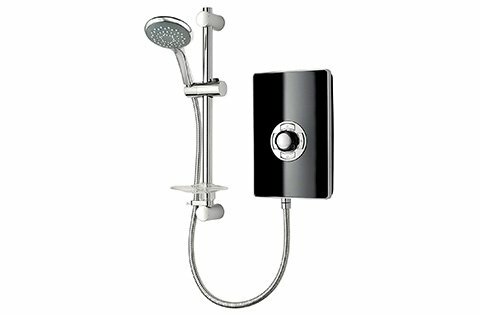 This electric shower has a slimline technology and five shower head spray patterns. This model comes with two-year full parts and labour guarantee. It is available in five fantastic colours that match well with almost all bathroom decors. Its control panel is very easy to use and navigate. It comes in a very sleek and modern design that will be suitable into just about any bathroom. It is very powerful and cheap to run. Regardless your bathroom wiring, you will be able to fit it in. The packaging comes with an easy instructional manual that will guide any new user on how to install and operate it. Creda Florida Plus comes in two different beautiful colours – white and silver. It comprises of separate temperature and flow controls and comes in three different power wattage – 8.5 kW, 9.5 kW & 10.5 kW. These controls have three power settings and a simple push button for on/off. Creda Florida Plus has a six spray mode that gives a very different showering experience. When you want to use it, simply push the start button to switch on your shower. From here, you can adjust your temperature and flow rate. Rather yourself up and enjoy a nice, hot shower. To stop your shower, simply push on that same button again, and it will automatically switch off. This model can pre-set power and flow rates – this way, the next time you use it, it’ll already to set to your favourite settings. It has a great water pressure. It will give you the best value for your buck. There are some faults with the hose at times. This model has a rotary power control that comes with three settings – cold, eco and high. This shower is excellent. 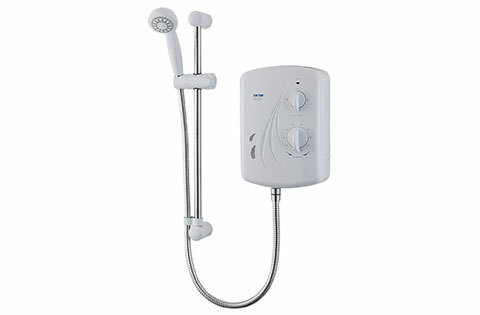 It has a large flat shower head that produces a very powerful water flow. It has a five shower head spray pattern and a rotary temperature control.Its shower head is made of stainless steel, making it very durable. You can install this device over a bath tub – it is recommended to use if you have a glass screen as the water flow can be wonderfully powerfully and might splash on your floors. Some users have complained that is a bit tricky to install. If you are looking for the most stylish electric shower, then this is just the thing. This model comes in such a sleek and cool design that will instantly turn your otherwise dull bathroom into a masterpiece. It has a push button for on and off options and a power selection for ease of use and temperature control. It also comes with a three-year manufacturer’s guarantee, a riser rail, anti-hose, and a great multi-purpose shower head. Its water flow and pressure is top of the line. A user will be able to enjoy a shower with great water pressure all the time. This model offers the best value for your money. Comprises of a sleek, sophisticated design that is very eye catching. Has a simple start/stop button that you will be able to operate with ease. Some users have found it difficult to use at first. 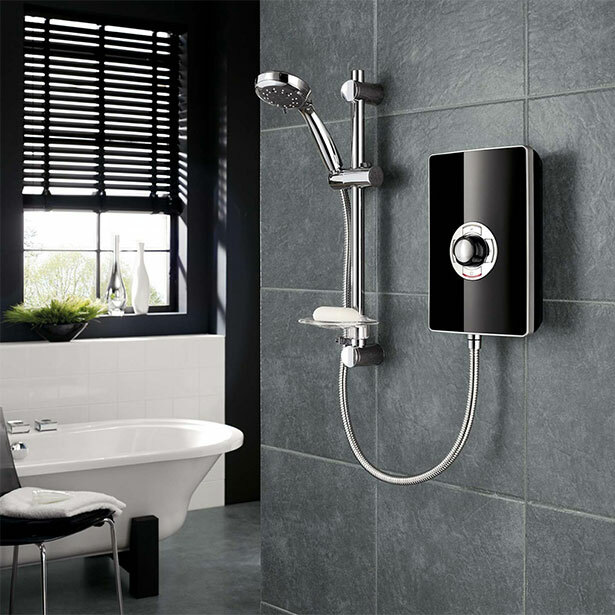 This is a thermostatic electric shower. 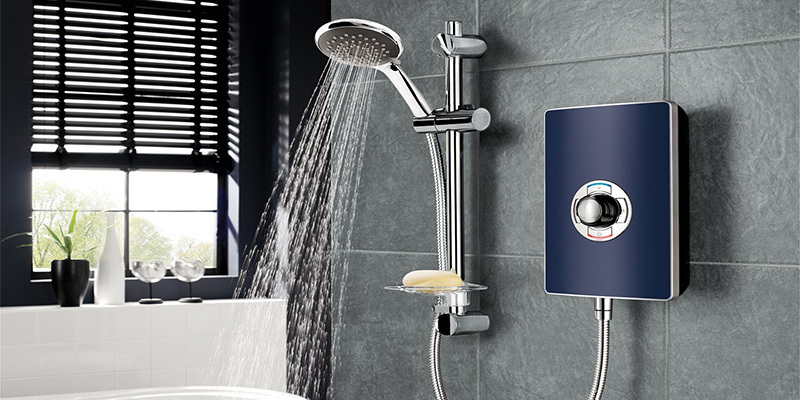 It has a power rating of 9.0 kW & 9.8 kW that provides the perfect showering experience. It has a simple push button used to start and stop the water flow. Aside from these great features, it also comes with an automatic shutdown of its heating elements if the temperature rises above a pre-set level. This ensures that you are always safe when showering. It also has a maximum temperature – this prevents a user from selecting an unsafe temperature. This one comes with a pressure stabilised temperature control that will allow you to control the hotness or coolness of your water. It comes in a beautiful white or chrome finish that will merge wonderfully with your bathroom tiles. The automatic shutdown setting ensures that you are safe at all times. The maximum temperature setting prevents anyone from selecting unsafe temperatures. Has a powerful wattage that provides good water pressure. It is too simple – if you are looking for something with a more classy design, then it might not work well with your bathroom. Electric showers are pretty simple, and they operate just as simply. A good electric shower in the morning can set your mood in the morning – it can also help and soothe your body after a hard day’s work. So why would you not invest in a good electric shower? The model you buy really is up to you. 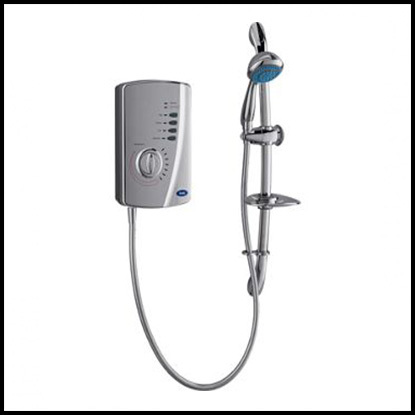 However, the above-mentioned models are the best electric shower on the current markets. After thorough research and testing, it is clear that these six models are worth every penny spent. 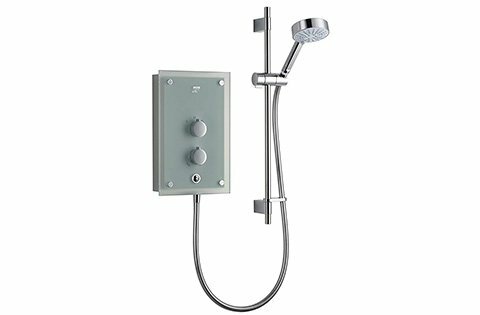 If you are looking for the best electric shower model that will be worth every cent, then we would recommend the Creda 53557581 All Chrome Electric Shower. It is fairly priced and provides a user with so many great features. 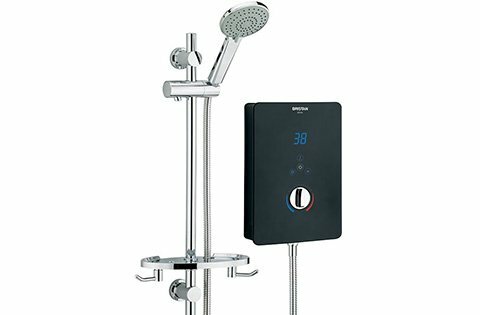 If you are able to afford a more expensive model, then the Mira 1.1643.003 Advance ATL Thermostatic Electric Shower is the way to go. This item is of high quality and provides exceptional performance all the time. If you are able to afford more expensive and more complex electric showers, then go for it. 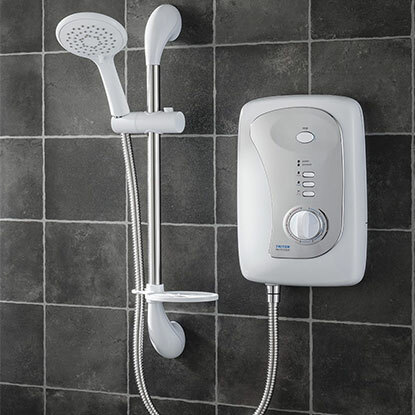 However, if you are working on a budget, there are tonnes of models out there for you too, but none can beat the Triton Seville Electric Shower. This item is cheap, yet contains great features, is durable, and also easy to install and operate. Next time you are hunting for a best electric shower, we got you covered. Our buying guide will help you figure out what to look out for and much more.